Purchased with the assistance of the Hildburgh bequest and the Murray bequest. 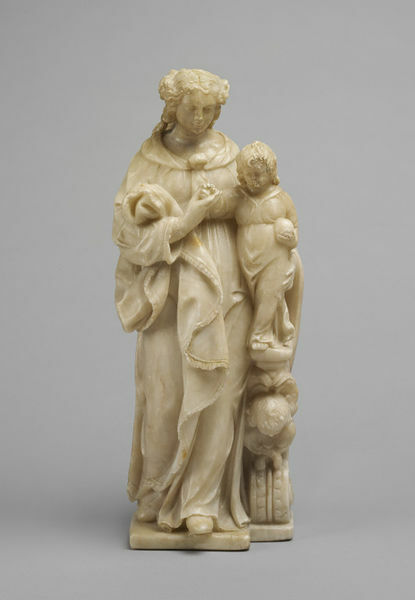 This statuette of the standing Virgin and Child is by one of the few women sculptors of the 17th century. Maria Faydherbe was based in Malines (Mechelen) in the Netherlands, and was the aunt of the better-known Malines artist Lucas Faydherbe (1617-1697), who is represented in the V&A’s collection by a life-size terracotta bust of Hercules. She was the daughter of a brewer, Antoine Faydherbe, and his first wife, Livine Grauwels. Maria was one of three siblings, who all practised as sculptors in Malines, her two brothers being Henri (father of Lucas) and Antoine Faydherbe, named after his father. How she trained, and the identity of her teacher, are unknown; she could well have learnt her craft with one of her brothers. 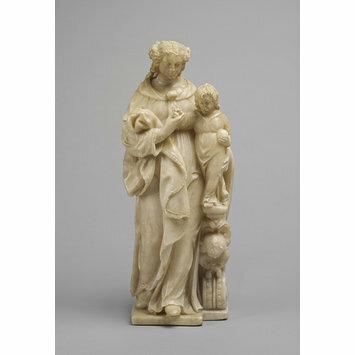 She is thought to have produced other large-scale variations of the Virgin and Child composition similar to this smaller figure, in wood and stone, as well as in terracotta. This small-scale sculpture depicts the standing Virgin supporting the Child, who is placed on an elaborately carved architectural pedestal adorned with a cherub and scrolled ornament. The Virgin holds the Child’s right hand in hers, while her left hand supports him, resting on his left thigh. He holds the orb in his left hand. Both figures step forward with their left feet, looking downwards, smiling, as if the group was intended to be placed above the viewer. The Virgin has abundant hair, coiled up in two plaited buns on each side of her head, and falling down to her shoulders. She wears a cloak knotted at the front, the folds draped over her right arm. The Child wears a simple robe. The back of the sculpture is relatively plain, almost flat, with just a few shadowy folds carved on the back of the Virgin’s dress, implying the group was to be set into a niche or against a wall. It has suffered minor surface damage; marks on the top of both heads suggest that metal haloes may once have been affixed to them. The figures are placed on an integral irregularly shaped rectangular plinth, beyond which the Virgin’s left foot overhangs. It is monogrammed on the reverse at the lower right, the ‘MF S.’ interpreted as an abbreviation for ‘Maria Faydherbe sculpsit’. Interpreted as an abbreviation for 'Maria Faydherbe sculpsit': Maria Faydherbe sculpted [this]. Bought from the dealer William Agnew, London for £6,500 in 2013, with the assistance of the Hildburgh Bequest and the Murray Bequest, as well as internal Museum funds; formerly in a private British collection. The Virgin supports the standing Child, who is placed on an elaborately carved architectural pedestal. Trusted, Marjorie, Maria Faydherbe: a seventeenth-century sculptor in Mechelen. In The Burlington Magazine, February 2014, vol. 156, pp. 104-106.